If you break out the bios, Jack and Gary Nicklaus combined to be the oldest team in the field at the 2015 PNC Father/Son Challenge. But for the Golden Bear, competition never gets old. Jack and Gary Nicklaus, the most veteran tandem at a combined 121 years, played for two days like they were trying to shoot their age. But after making several early runs on both Saturday and Sunday, Team Nicklaus came up five shots shy of the lead and an eventual four-team playoff. Their final-round 65 and two-day total of 15 under at The Ritz-Carlton Golf Club, Orlando, left them tied for 14th. A foursome of teams finished at 20 under: Lanny and Tucker Wadkins; Larry and Drew Nelson; Davis and Dru Love; and Fred and Taylor Funk. Team Wadkins took the victory when 23-year-old Tucker sank a 40-foot eagle putt on the first hole of sudden death, No. 18. “I don’t play much golf any more, but when I do, I certainly want to be competitive, and I certainly think we were,” Jack said. “For all that I love about the game of golf, it is no secret that golf has always been my vehicle to competition. We played well at times, hit some good shots, made a few runs, but missed a few shots and putts when we needed them. 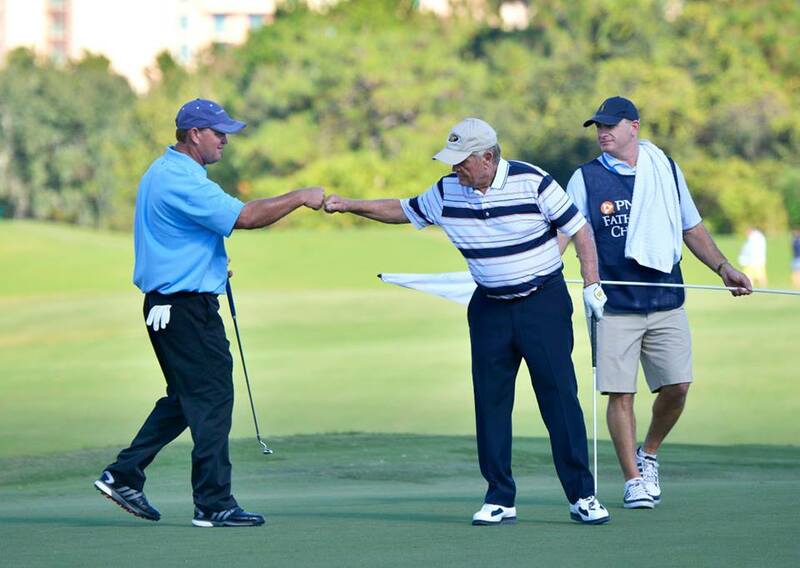 Jack, 75, was playing in his 14th PNC Father/Son Challenge, while Gary, 46, was his partner for the seventh time. The duo won the Father/Son Challenge in 1999 at TwinEagles in Naples, Fla., on the Talon Course co-designed by Jack and son Jack II, president of Nicklaus Design. Team Nicklaus was part of a Hall-of-Fame field of greats who have amassed 350 PGA TOUR victories and 64 major championships. Of course, a record 18 of those majors belonged to the Golden Bear. The field also included nine former Ryder Cup captains, as well as current U.S. Ryder Cup Captain Davis Love III. The field, as well as representatives from sponsor PNC Bank and pro-am invitees, were treated to a Q&A on the eve of the tournament between Love and NBC’s Jimmy Roberts. On the same night, Jack and Gary walked away with a trophy for being the “overall net champions” in the PNC Father/Son Challenge Pro-Am on Friday. The following day, Jack and Gary opened the first round of competition with birdie putts by Jack on the first two holes. They eventually finished Saturday’s first round at 8-under 64. They opened Sunday’s final round with a surge of birdies and actually tied for the lead, before a bogey on No. 9 and a string of five straight pars from Holes 13-17 left them five shots off the pace.